Truth be told, after my first Plastic-Free Tuesday I needed some regroup, thus.. my second Plastic-Free Tuesday went by without much ado. However, I’m back now, with what I like to think is quite a bit of progress! My city, Groningen, has three per week but I generally go one day, on Saturdays, sometimes on Tuesdays as well. This is actually the real winner for going No-Plastic I’ve found. More about this later in the post. 5. Baked my own bread(s). This has been very useful and interesting. I can really recommend everyone ‘Plastic Planet’, which is a longer documentary. Also I’ve watched a few interesting plastic production clips on You Tube, here and here. I still plan to watch ‘Addicted to Plastic’. For ‘Plastic Planet’, please bear with it through the beginning, I think it starts a bit strange.. but it usefully addresses a whole lot of issues! Below I am commenting a bit more on each of the new steps, hoping you find it of interest! Also I still have some challenges and questions left, so comments are again more than welcome! I think where I did probably best over the past weeks is on the breakfast front! My first Plastic-Free Tuesday demonstrated that I had a lot of plastic there (muesli, yoghurt, dried fruit, coffee, honey), but I am now enjoying the following plastic-free options, in fact, every day of the week! Yeay for that! Yoghurt (local, organic) in a glass bottle, subject to ‘statiegeld’ from Ekoplaza + dried fruits or fresh fruits or assorted nuts. I get all these at the market, using my own glass containers, see more later on that later on. 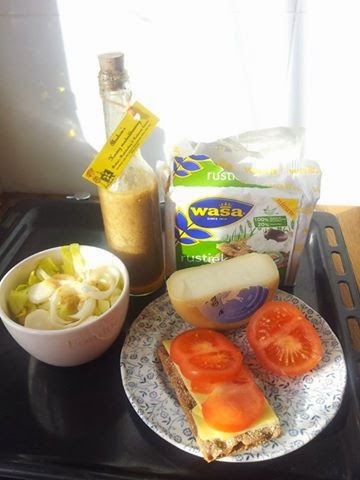 Crackers from the brand ‘Wasa’ + cheese or avocado or vegetables or whatever (also see under ’lunch-time’). Thanks, ‘duurzaamtoch?’! Truly, a great find! Home-made (focaccia) bread with topping (also see more in lunch). 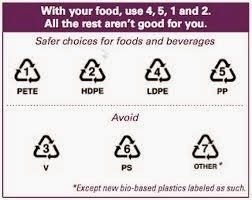 indicated to me (after sending them an email about it) that their cups contain so-called “Bisphenol A” (BPA), which a controversial hazardous toxin in some types of plastic, i.e. types ’03’ and ‘07’ plastics mostly. (also see ‘Plastic Planet’ documentary). BPA is said to cause rather severe hormone/estrogeneimbalances, besides other effects. If interested to know more: e.g. here (English), here (English), here (Dutch, ‘Voedingscentrum’, old message), or more recently this broadcast from Tros Radar, 2012. Very interesting as well is the website of the European Union’s Food Safety Authority (EFSA), which is currently reevaluating BPA-hazards and potentially regulation. BPA is already forbidden in baby bottles, and in some countries for wider kids products. Nestlé indicated that their cups currently comply with the current EFSA regulations, but the question I guess is whether these regulations are up to date/sufficient… They also said that they take customer preferences seriously, and will use a different plastic once available. But my question is now.. should I quit the machine altogether?? Not sure yet.. More on this later! Lunch-time also proved a rather big challenge last time, but has become much better with the introduction of the ‘Wasa’-crackers! Thanks again! I ‘m eager to move on to more sophisticated/healthier breads and to get rid of the final small piece of plastic around the packaging of the yeast. Yet, I’ve not been able to find many flours or wheats in a fully paper bag..? There is always some plastic looking sticker on the packet..? Any tips, yes please! On another small note: I also went to one bakery shop and asked them if they make the bread from scratch there, it turns out they do, but the bread might still end up being wrapped in a lot of plastic every day to keep it fresh..? That does not really add up. 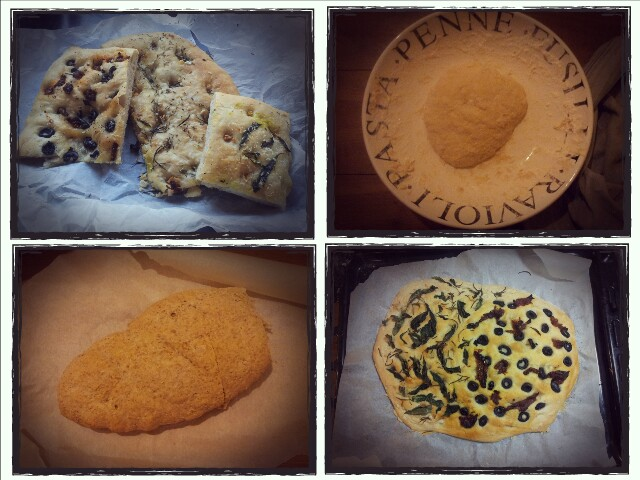 So in that sense, I think I will stick with the baking every now and again, besides crackers, which I like a lot. Easiest no-brainer still: Pasta (spaghetti, penne, lasagna can all be bought in card board at my supermarket) + assorted vegetables (e.g. onion, garlic, eggplant, mushrooms, spinach, bell-pepper, zucchini, all from the market without any plastic wrapping), home-made tomato sauce/pesto-sauce (or as purchased in glass pot.., fresh herbs (e.g. basil), cheese (also bought from market, bringing my own container, more below). Risotto (card board container), using vegetable stock (small metallic wrapper if not home-made), white wine (bit of plastic on the bottle there…but no other option and I drink it anyways..), garlic, onion, mushrooms, zucchini, spinach and some nice cheese (e.g. parmesan, bought at market). Many risotto’s are possible, such as beetroot risotto (fresh beet root, mushrooms, some sliced carrots, spring onion, fresh cilantro and goat/parmesan cheese), or a butternut risotto (not yet tried). Roasted assorted vegetables and potato’s and herbs from oven. By far easiest I think. Simply put e..g pumpkin/butternut, nice potato’s, carrot slices , garlic, rosemary, salt in the oven and bake. This is also one of the fully ‘waste-free’ options. Rice (in card board) + assorted Chinese vegetables (eggplant)/mushrooms stir fries . Sauce may come from a glass container, e.g. soy sauce, chili bean sauce. I personally love Fuchsia Dunlop’s Chinese cook books, e.g. ‘Every Grain of Rice’, also available in Dutch. Bean-burgers, especially great if you can use dried beans from the market and not get them in a can or glass (bought dried ones, but not yet tried). Mash beans, add some grated carrots, grated cheese, egg/bread crumb, and various herbs & spices of choice, e.g. paprika-powder, chili-powder, fresh cilantro, or cumin, ground cilantro seeds, or curry. All can be purchased at the market. Burgers can be complemented with roasted vegetables, baked potato’s, or bread or salad. A stuffed bell pepper, with rice, tomato (puree), other vegetables, some stock, (fresh) herbs (e.g. cilantro, basil) and e.g. goats cheese on top from the oven. I prefer these with couscous or quinoa actually, but haven’t found this without additional plastic packaging in the box? Any tips? Nice with additional salad. Finally I personally much like rice + ‘roti’ filling (= Surinam dish). It contains: ‘Kouseband’ (long green bean, my Jumbo supermarket has it) or haricot verts, onion, potato’s, (Hindustan) masala spices, ground cumin, ground cilantro seeds, vegetable stock, Mme. Jeanette pepper (small yellow pepper, also at my supermarket), tomato (puree), and as many boiled eggs as you like. So actually plenty of options already, though some more successful then others. What I would really like to find is: Plastic-Free tofu…? Anyone has any thoughts on that..? that would be super helpful! Finally, a few notes on my market visits, and mostly: how to deal with FRIENDLY people! Considering that the market has been the main contributor to no-plastic improvements, a few further thoughts on that. 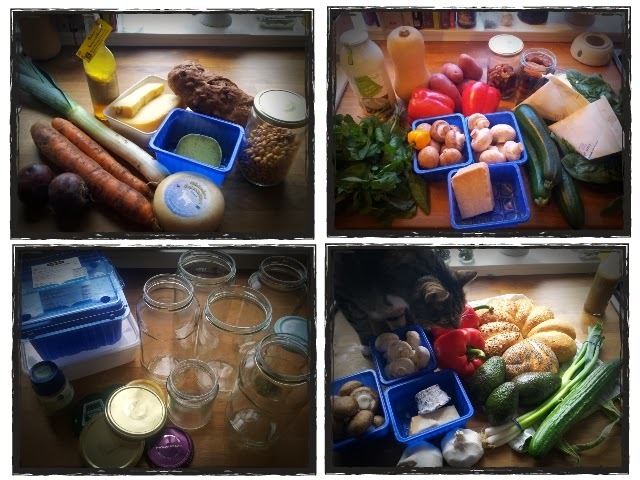 First of all, it found it very useful to collect some containers before taking my trip – I critically reviewed all items already in my cupboard and fridge such as glass pots or other reusable (plastic) containers, had many as you see. Got some of the following containers and purchaches (nosy cat approved as you see). Overall, I was extremely happy to find that most stalls were very willing to accept my containers, and even got some encouragement from some. In any case, it seems very clear I am not the only one making these kinds of requests. Yet… one of the most surprising and tricky things I’ve found about the market place: it can be a real challenge to deal with all the very FRIENDLY people there! (rather than UNFRIENDLY people, I didn’t really meet any of those actually). Explanation: A very nice lady at the dried fruit stall was super forthcoming in handing me an apricot to taste, which I was eyeing while building up courage to bring out my glass pot, for which she very hygienically… wrapped a huge plastic bag around her hand! Oh no.... mission totally defeated? What do I do, do I still hand her the pot, do I take the bag?? Gave her the glass pot anyways Then, similar situation with the kind lady selling dressing, who kindly offered me an additional paper napkin to protect the cork from leaking in transport (super friendly, and no plastic, but still.. not very successful in eliminating needless waste there). Also, the man at the honey stall gave me a disposable wooden spoon with honey as I was looking at his produce (same issue as the dressing and apricot lady..) while personnel at the local nut-store got confused at my container request (though very accepting of it) first wanting to put the nuts in their paper bag, after which she could pour them more easily in my glass container. This would not save me a thing, as you generally buy the nuts at this place in a paper bag  So I might as well take the bag. Finally, also got some confusion at the bread stand, finding much support for not wanting an extra plastic bag, but only just being able to prevent the girl from wrapping my bread in a separate plastic foil anyways… haha, oh no… So, basically, buying plastic-free seems good for the reflexes. In any case, I think it already really helps if you say that you’re trying to buy your stuff ‘waste-free’ rather than ‘plastic-free’.. I think you actually need to figure out how you feel about paper bags before you go to visit the market for Plastic-Free Tuesday: if OK, the market will be a breeze, most stalls seem to have them. For now, I think I will try a ‘waste-free’ approach. Finally, the only place where my container-request was (kindly) rejected, was at the spices/herbs stall. The lady there said she gets multiple requests like mine, but that the purchases are already quite labor intensive and that it costs too much time to adjust the scales each time for the containers and trying to squeeze the spices into small pots. She openly approved of my somewhat bigger pot (yes! ), but seemed to have a bottom line.. To be fair, it did look like it would be quite a hassle with the spoon she was using. She offered me to come back with the paper bag though, as the other people did. Alright, think I leave it at that! Hopefully next time a bit more on the cosmetics front. In any case, today I bought a (Marseille) soap at De Tuinen shop (though I now see it is ‘perfumed’.. can’t find anything on that further..? btw, it was rightfully pointed out to me that the Lush-soap still contains many chemicals, so considering some other options). Also, have started to explore the many wonders of ‘baking soda’..! And considering to join the ever-growing ‘No-(Sham)Poo” movement, see here, and here. I’ve got the means, but now the courage… (check links to see what I mean if you’re not familiar)! Again, many thanks for reading guys, and if any new comments or tips, yes please! On the tofu issue: I have tried to buy tofu at at least three different Asian stores. Some of them sell not only the prepackaged tofu but also some kind of fresh tofu, which basically means that they have a bucket of tofu in the store. However, I have not been able to convince any of the personnel to not use a plastic bag to transfer the tofu from the bucket into my container... Perhaps I should bring my own spoon... Perhaps you should have a look in the Asian stores in your city. Please share your experiences here. For now, I don't eat any tofu. Have considered making my own (been reading Sandor Katz' book on fermentation), but am not yet ready for this. Flour in bags that are made of paper only might be sold at wholesalers or at millers. Where did you get garlic without plastic? :-O I stopped buying it as it's only sold in nets made of plastic. Isn't pasta sauce in a glass jar sealed with a lid with plastic? Great story about the friendly people at the market! I also noticed that you indeed have to be very quick to say NO bag! Stop! I am collecting the paper bags I get from the Odin fruit & veggies package. They are quite robust. When it comes to soap, I think the only way out of chemicals and plastic is to make your own. But I have yet to find a Dutch (web)shop selling an organic/non-chemical substitute for drain cleaner (gootsteenontstopper). Right. Sorry for the misunderstanding on my part. I once made a batch of my own laundry detergent. Never made my own soap though. I am very satisfied with the Nablus soap. I have not found anything that is better. Nablus soap is also made with sodium hydroxide, or NaOH better known as drain cleaner. It will evaporate in the process of soapmaking, but if I make it myself, I'd rather do without. Anyway, that has nothing to do with plastics. Interesting! Tell me more... can you make soap without sodium hydroxide? What do you use instead? Wood ash? Yet, I’ve not been able to find many flours or wheats in a fully paper bag..? There is always some plastic looking sticker on the packet..? Any tips, yes please! Meel bij de AH, PLUS, Spar en Jumbo zit gewoon in papieren zakken (onderste plank in de schappen, huismerk). Ik haal zelf altijd meel bij de molen, die zit ook in papieren zakken. 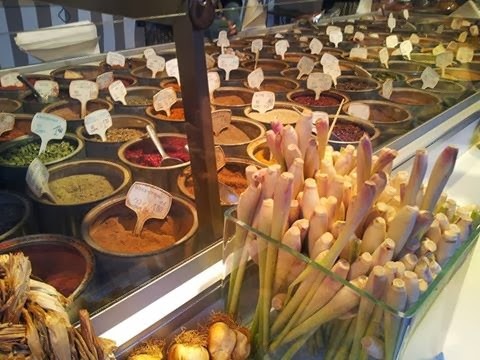 I bought a (Marseille) soap at De Tuinen shop (though I now see it is ‘perfumed’.. can’t find anything on that further..? Dit is Marseillezeep zonder parfum. Voor de ingredienten had ik ze gemaild, het zijn: Sodium olivate, sodium palmate, aqua, sodium palm kernelate/sodium cocoate. Ekoplaza sells plastic-free flour too. And I have also seen it at the organic market in my city. Hey everyone! It took me while to respond, I am sorry! Thanks again for all the great comments and questons. @ all: the flour I have seen at eko place comes in a paper bag, but I am not convinced that the large label/sticker (etiket) on the front indicating what kind of flour it is, is in fact made of paper as well? it looks very plastic or other material, not sure if that would be able to go in the waste paper bin for example (e.g. this one: https://webshop.ekoplaza.nl/nl/voorraadkast/bakmiddelen/speciale-melen/8711521916313.html.) The paper wrapped flours inthe supermarket work well, but I am intersted to try other flours as well, all my supermarket's (Jumbo) 'special flours' are in plastic, Its only the plain white or wheat flour which comes in paper - indeed the huismerk brands. I am trying a miller through Jildou shortly I guess, see what that brings, I like that idea actually. I have also just baked a first bread with baking soda and vinegar, an Irish soda bread! looks quite nice, but curious about the taste.. will let you know if it worked. Also, I could do it this time because I got a bottle of milk with a metal cap from germany this weekend, so truly a plastic free bread, but not sure where I could buy milk without plastic in the Netherlands. :-) May try something else next time. anyone else experience with soda breads? @ Ellis: my garlic/onions/potatos all come from the market nowadays, where they are sold without their plastic nets, per piece. Finally, on the lids of jars: that's a concern duly noted and included as a next step, I am first on a temporary switch to glass jars I think:-) but I want to get into this more, and send out some emails on cans and jars to some producers as well - an added issue on lids and cans seem to be actually BPA in the plastic on the lids and inside cans (had put a paragraph on that in the blog originally but I took it out again, I think there is a post on this blog about it somewhere as well). Anyone already did some research on that to share? i.e. which canned vegetables have a plastic/BPA issue? @ selene, I think I was too quick to buy the soap from De Tuinen, but at least no plastic container on this one as I switch to another alternative or finally sit down to place an order for the Nablus soap..so slow progress, but considering the previous products used, quite a huge step already :-) I see you can get the MArseille soap at Dille and Kamille? that Is also useful, still have a thing about ordering...think I simply need some more time to think about the cosmetics issue. When inquiring, producers may indicate that they do not use BPA, however, it is questionable whether the alternatives are any safer or better. How can we tackle this problem? Just not buying any canned food? Any other solutions? I think getting in touch with the producers of our food is definitely a helpful thing to do, but this won't fix the BPA problem right away. Lots of paper packaging for food is also plastic lined! Soap Flakes are pretty much pure and can be used for everything from hair to floor. Thanks Pam, I find your site very interesting and helpful!